The Berger Picard is a pack dog. It must be a member of your pack. It does not do well being isolated from the family. The Berger Picard needs early socialization with family, friends and children. The Berger Picard is a pack dog. It must be a member of your pack. It does not do well being isolated from the family. The Berger Picard needs early socialization with family, friends and children. The Berger Picard will learn quickly but needs a trainer who can display a natural authority. 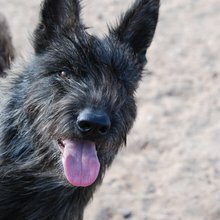 The Berger Picard is an energetic and sweet-tempered dog who does well with children and loyal to the family. They are alert and do well as a farm guard. You can find Berger De Picardie puppies priced from $2200 USD to $2200 USD with one of our credible breeders. Browse through our breeder's listings and find your perfect puppy at the perfect price. Berger De Picardie Puppies for Sale - Shipped Worldwide! Finding the right Berger De Picardie puppy can be dog gone hard work. PuppyFind® provides a convenient and efficient means of selecting and purchasing the perfect Berger De Picardie puppy (or Berger De Picardie puppies) from the comfort of your home, 24 hours a day, 7 days a week. Take advantage of our PuppySearch or leisurely browse our directory of hundreds of dog breeds, Berger De Picardie dog breeders, Berger De Picardie dogs for adoption, and Berger De Picardie puppy for sale listings with photos and detailed descriptions. Some Berger De Picardie puppies for sale may be shipped Worldwide and include crate and veterinarian checkup. Many Berger De Picardie dog breeders with puppies for sale also offer a health guarantee. With thousands of Berger De Picardie puppies for sale and hundreds of Berger De Picardie dog breeders, you're sure to find the perfect Berger De Picardie puppy.